Most people associate storms and other big weather with death—with the kind of force that makes each of us wonder about life, and time and the nature of our surroundings. Some people go out looking for bad weather or go to places where they're likely to encounter it. Others have the misfortune of being at the wrong place at the wrong time. 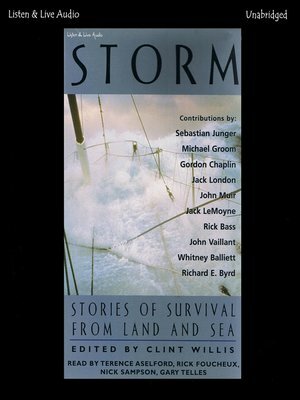 Still, the stories in Storm have more to say than that. They tell us about what happens when people find that treacherous weather—or when it finds them—and we are reminded of the fragility of life, the capriciousness of Nature's will, and how little we can do when both cross paths.